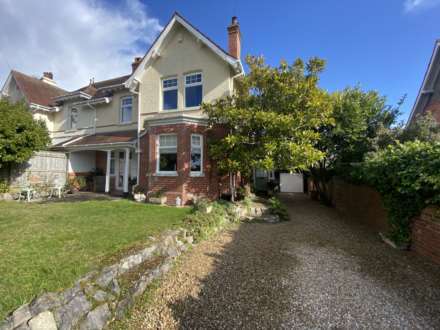 Situated within level walking distance of Exmouth Seafront, Town centre, Parks and Train Station is this renovated, deceptively spacious, 2 double bedroom, semi detached house with an off road parking space. Updating works include re wiring, re plumbing and re plastering. The gas centrally heated (from combi boiler) and uPVC double glazed property comprises, on the ground floor, of bay fronted living room and brand new fitted kitchen / dining room with integrated appliances. On the first floor are the 2 double bedrooms and brand new fitted, 4 piece, bathroom suite. This would, perhaps, make an ideal holiday home and an appointment to view is strongly advised. Dual aspect having window to front, window to side and uPVC double glazed external door to side. Brand new fitted Howdens kitchen comprising cupboard and drawer storage units with roll edged work surfaces and matching upstands. Stainless steel one and a half bowl sink with single drainer unit and mixer tap. Built - in 4 ring gas hob with filter hood above. Built - in, eye level, double electric oven and grill. Integrated dishwasher, washing machine, wine cooler, fridge and freezer. Concealed, gas fired, combi boiler supplying the central heating and domestic hot water. Inset ceiling lights. Ceiling mounted smoke / heat / carbon monoxide detector. Brand newly fitted, moisture resistant, laminate flooring. Stair case rising to first floor. Window to front. Built - in single wardrobe. Radiator. Brand new fitted carpet. Dual aspect having obscure glazed windows to front and rear. Brand new fitted, 4 piece, white suite, comprising roll top bath with feature mixer tap and shower attachment, double shower cubicle with thermostatically controlled shower unit, concealed WC and vanity wash hand basin. Heated towel rail. Fitted LED mirror with built - in de-mister pad. Inset ceiling lights. Access to insulated loft space with ladder. There is a small area of easy to maintain garden to the front with a brick wall and iron balustrades boundary. There is an off road parking space to the side of the property. From our prominent Town Centre office, by foot, walk down Rolle Street and through The Strand Gardens into Victoria Road and onto Imperial Road. The property will be clearly seen, identified by our For Sale sign.